Children's playgrounds don't encourage enough risky play, a University of British Columbia researcher says. Susan Herrington, a professor in the school of architecture and landscape architecture at UBC, has been researching children's playgrounds for more than a decade. She was inspired to conduct her research when she noticed how many children in Vancouver playgrounds seemed bored. "They just go from one thing to the next, and nothing seems to engage them," said Herrington. Herrington's research involved surveying more than 600 people about their opinion on playgrounds in their neighbourhood and how they compared with those in their childhood. Seven out of 10 people surveyed felt the playgrounds were too safe. Herrington said many of the respondents recalled playing outdoors, scrambling around in trees and ditches. To make play areas more interesting, Herrington suggests adding more elements like tall grasses, trees and other natural features. She also suggests adding more challenging elements like tall slides and climbing structures. "If you look at childhood development and the way that children learn, they need to be able to take gradual risk so they can learn the consequences," said Herrington. Children need to be able to manipulate their play space, she said, calling sand and mud preferable to rubber mats and fences. Playgrounds in Norway feature some of the most challenging environments for children, she said, allowing them to climb rock faces without helmets and to use hammers, saws and nails. "All kids want to play and all kids want to be challenged," said Herrington. 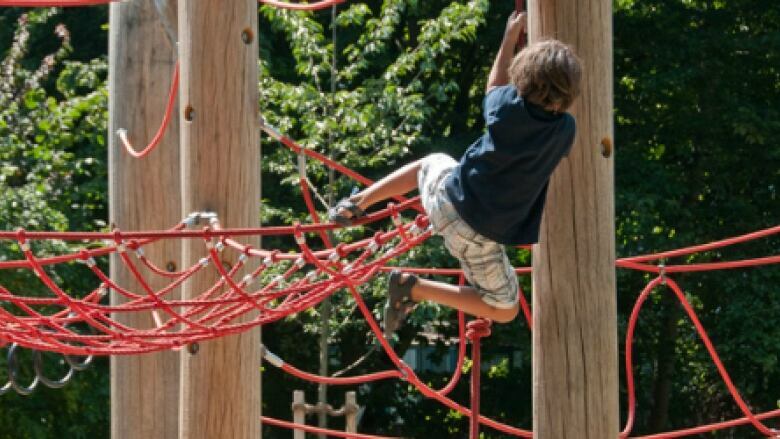 To hear the full interview, listen to the audio labelled: Are playgrounds too safe?